Conkers. This is way we make our annual late season trip to Dorney Lake so Coach 2 can collect a bag full of conkers. We didn’t have to get up super early for this race as my Wave didn’t start until 11:30am so we had a leisurely drive up to Dorney Lake, set up transition, checked all the Ins & Outs then assembled for the race briefing just before my 11:30 start. The water temperature was supposedly 17.5oC but when I entered the water it didn’t feel like that. 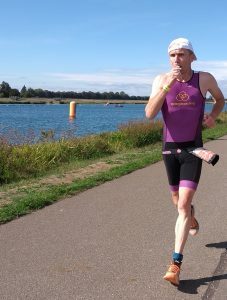 The swim was a 1500mtr 2 lap swim & I spent most of the two laps trying to get on the back of two people in front of me who were agonisingly about 5mtrs away, but whatever I did I just could not catch up with them. 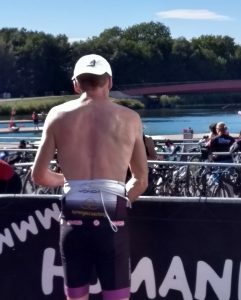 Out of the swim for T1 & then onto the eight lap, 42.5K bike course around the lake. This is quite straightforward, up one side of the lake & into the head/side-wind then back down the other side with not much of a tail-wind. I just plugged away with this & seemed to have plenty of people to overtake as there were many waves & many distances all completing at the same time. I enjoyed the ride, in a painful way. 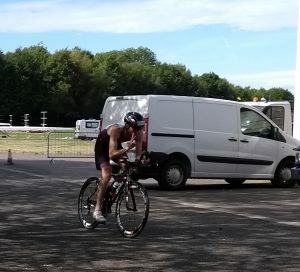 Into T2 for a semi-quick transition because as I was running out there was a man departing transition with bike & bags. I shouted to him “on your right” so what did he do? He moved to his right & I ploughed straight into him & nearly pushed him over only to be told by him that I wasn’t a very nice man (but not exactly in those word though). 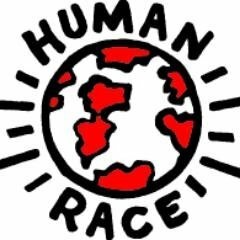 I headed out onto the four lap 10K run which was out & back. Again, I had the head/side-wind out & not much of a tail-wind back, but that is what it felt like anyway. 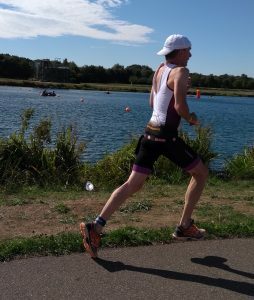 On the second lap, some guy came out of transition & was running quite well, so I thought that I could hang onto him to assist me but I had to do a “Vicky” & back off a bit because he was taking me out of my comfort zone. But on the beginning of lap 4, I managed to start pulling him back & then just used him all the way up to the turnaround point & partly on the way back to the finish & then I had a good sprint to the finish line.